After what feels like an eternity, this year’s Sasquatch Music Festival lineup was finally announced last night. The big names this time around include hip-hopper Kendrick Lamar, legend Robert Plant, pop songstress Lana Del Rey and Washington’s own Modest Mouse. And while these headliners will separately close out the main stage each of the festival’s four days, they aren't necessarily who we’re looking forward to seeing most at the Gorge Amphitheater over Memorial Day Weekend (May 22 – 25) . Those artists would be: The Decemberists, Jenny Lewis, St. Vincent, Father John Misty, Gogol Bordello, Run the Jewels, Ryan Adams, the New Pornographers, Of Monsters and Men, the War on Drugs, Sharon Van Etten, Schoolboy Q, Chromeo, Alvvays and many more. The lineup also includes artists who have somewhat recently been through Spokane like Shovels & Rope, Future Islands, Odesza, Twin Peaks, Rose Windows and Royal Blood. As always, laughter will also be big. This year’s comedy tent will host the likes of Doug Benson (who was also just in town), Leslie Jones, Cameron Esposito, Pete Davidson and more. If you’re absolutely ridiculously wealthy, look into the $5,000 two-person glamping experience. Otherwise, a regular camping pass will run you $350. 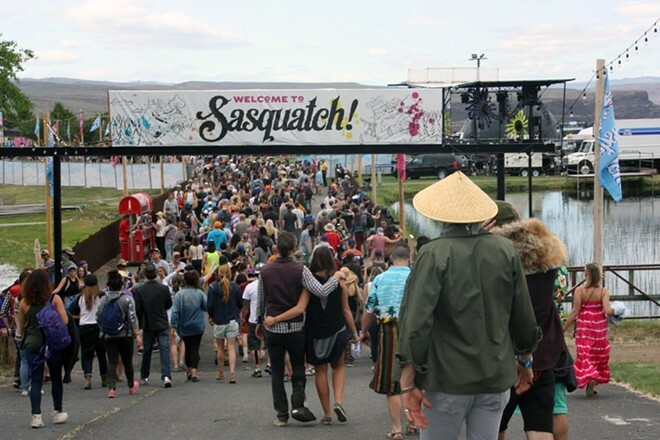 Sasquatch Music Festival passes go on sale Saturday at sasquatchfestival.com. Undoubtedly, they will sell out quickly now that we’re back to the one-weekend format. Reminisce what happened at last year's festival here.